Market Registrations: Market registration for vendors for the 2014 market is opening on February 13, 2014 at managemymarket.com. If you are not already registered on that site you will need to do so before logging in. Purchasing locally from small businesses such as these is a healthful and enjoyably social way to invigorate the local economy. It reduces carbon emissions by avoiding long-distance supply chains. And it helps to maintain and build the local farming base as a way to ensure a plentiful food supply in the uncertain future. 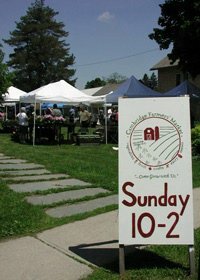 The market is held every Sunday from 10am-2pm in the summer and is located in the park across from theCambridge Hotel, next to the railroad tracks that cross Main Street. During the fall and early winter (through December 20th), the market moves into the Lovejoy building behind Hubbard Hall and is held every Sunday from 10am-1pm. From route 22 or route 313, turn west onto Main Street (route 372) and proceed Broad Street (for the summer market) or Washington Street (for the winter market). See also this map. For more information and news, see the Cambridge Farmers Market Facebook page.